The more I interact in this online thrifting community, the more I see distinct catalysts that keep us thrifting and junk hunting. This We Thrift Because... series explores why we thrift. As thrifters, we're adventurers. We thrive off of the unpredictable nature of the hunt. Like Indiana Jones, we risk the obstacles to rescue neglected vintage treasures. When I started college my car was always ready for adventures. In the trunk there was plenty of clothes (thrifted, of course! ), travel-sized toiletries, towels, and swimsuits. I could call friends at midnight and say, "Let's go the beach right now!" or "We're going to the graveyard to improvise bad gothic poetry!" and the wacky ones would come with me. We could be gone as long as we wanted because the trunk had everything we needed. I'm nostalgic about that light-hearted, worry-free time, and I'm happy to report I feel stirrings that former spirit awakening from its short reprieve. 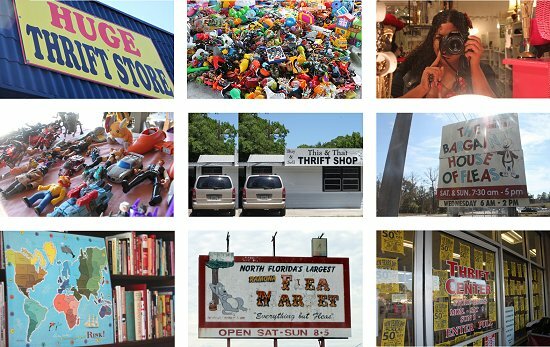 I'm ready to explore Florida's numerous wacky tacky tourist attractions (I wrote about a favorite one here), junk stops, and thrift shops this summer. My "Adventure Kit" is packed and ready! You're invited on this thrift adventure with me, because I'll be writing about thrift wonders and vintage marvels I encounter along the way in this thrift, kitsch and mod wonderland called Florida. What Thrift Adventures do you have planned this weekend? Not quite s adventurous, but I will be scoping out neighborhood yard sales and a trip to my two favorite Goodwills are always a possibility. Happy thrifting to you all! Thrifting is an adventure! I'm addicted to the thrill of the hunt! This is so true! One of the reasons I love thrifting is the sense of discovery & surprise. It's like a treasure hunt! P.S. - If you stop in Sarasota, drop me a line... I can point you to junk & thrift shops galore here! That sounds like so much fun! Keep us posted! Kate: I LOVE Sarasota and go to visit my friend who's going to college there occasionally. I'll have to drop you a line to get tips on those thrift haunts! Diane: That's the thing, thrifting makes yard sales adventurous. You never know what you'll uncover...even in your own neighborhood. I can't wait to follow your thrift adventure. I think I love thrifting because it reminds me of family vacations. 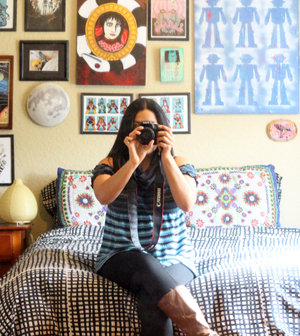 Finding the quirky, fun, kitschy spots - and now, it's finding the quirky, fun, kitschy items. Here's to the hunt! excited to see what you find! i *might* go thrifting this weekend. if so, just 1-2 local places, nothing crazy. Headed to New Jersey to see what the flea markets are like. Enjoy your weekend! I'm a huge fan of vintage, kitschy vacation stops - absolutely love those little bits of Americana! Wish I could get in the car and go with you but I'll be happy to read all about it. have a great time! And get some great junk! Monogirl: No fair! I've been chatting with friends about getting a Nation Wide thrift adventures sponsored someday. That would be a dream...I must check out allthriftystates.com asap! Girl, it's ALL ABOUT the Weeki Watchi Mermaids. Put that straight up first on your adventure list. You won't be disappointed. Into Vintage: Me too! I feel lucky to live in Florida, this place is packed with junk stops, thrift shops, and kitschy mod spots. Fenn: Hell yes, I'm literally writing this as #1 on the list! :) Can't wait! Please provide as many suggestions as possible for my journeys. Can't wait to hear about your thrifting road-trip. Sometimes I shock myself at my willingness to go into really grim, grotty shops in the hope that there is something lovely waiting for me. Usually there isn't, but it's all part of the adventure. After a few weeks of solid thrifting adventures, Mr. Butter and I have nothing planned for this weekend. Which is lovely because I need to take photos and list things in the shop! That said, I'm *sure* we won't be able to resist the siren's song of thrifting for the whole weekend. While I envy Jenna's summer road trip, I can't imagine narrowing it down to one or two stores per state while on the road. Though I guess the cost of gas and price and deadline of the RV return might keep me motivated. Custardino: Grim grotty shops usually pay off for me. I'm a sucker for them! Always worth the risk, even if you want to wear gloves while hunting. Bit of Butter: I bet you won't be able to resist ;) ! Monogirl: Now we're cooking! Keep in touch and do some research along with me, this isn't an impossible goal! i am spending this weekend in Vancouver to celebrate our son's 19th birthday. The city is putting on a weekend of free concerts in STanley Park - how nice of them to do that for us! And if i get a chance, i'm going to check out a few favourite thrift shops! VAn, have you been to the new HarryPotter theme park? This is one attraction that would bring me to Florida - i'm a total Potter geek. Angelika: I hope you have fun in Vancouver this weekend. I didn't know that a Harry Potter theme park existed! Florida has many attractions that make it worth a visit, I love it here. Well Van, I'm pleased to announce that I can officially kick off the orthopedic boot. This also means I can get back in the driver's seat. This ability alone means an adventure, even if it's a quick trip to the 7-11. I so want to hit all my favorite suburban thrifts but I think I should stay somewhat local in case I have too much pain in the beginning of my return to wearing two normal shoes. Here's hoping for some fun finds! I thrift because I love the potential that sits on each shelf! Great photos - I'm jealous of the HUGE Thrift Store which sounds awesome. Today I noticed a new place popped up, so I got some new goodies to list online. But my main thrifting plans for the weekend include photographing the mound of stuff I have here to share and getting it into my store! I'm excited. Sometimes I forget what great stuff I've already found! Jackie: Congratulations, that's got to be liberating! Good luck with your hunts! SixBalloons: The "Huge Thrift Store" is actually called "My Brother's Keeper". It's gotta be the biggest Thrift Store I've ever seen, it's incredible! Flipping Out Vintage: It's fun to revisit past found treasures and see them in a new light! I'm planning a two day trip to Vermont this summer and already have the maps to their local thrift stores. The rental car is coming home full! !